"Do you dream too big? I don't think you can ever dream too big. That would be incredible but I realise as well you can't go in somewhere like Chelsea as your first job." 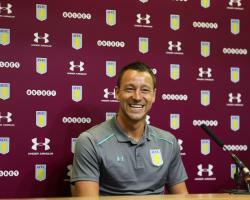 Terry, who made over 700 appearances and won 15 major honours with the Blues, signed a one-year deal with Villa on Monday after snubbing more lucrative offers to remain in the top flight. Swansea and West Brom were keen to keep him in the uppermost division but the ex-England captain, whose capture was announced in a faux WhatsApp conversation by Villa, revealed he was uneasy about representing one of Chelsea's Premier League rivals so soon after bidding farewell. "Playing against Chelsea just doesn't sit right with me, to be honest," he told Press Association Sport. The raw emotion of leaving the club after so long there...(playing against them) just didn't sit right with me. "I had a lot of big financial offers to play in the Premier League and still play at the top, but once I took that decision out of it - that I wasn't playing in the Premier League - this was an easy one for me. "For a few weeks I switched off and a lot of managers gave me a lot of time and respect to make my decision and come to terms with it. They were 22 fantastic and unbelievable years that I will never forget but I'm excited about this challenge here of getting us up." It is understood the FA is still looking at the defender's pre-planned substitution against Sunderland in May, which was scheduled to begin in the 26th minute in a nod to Terry's shirt number, after three punters who wagered a bet on that very outcome were paid out by a bookmaker.